Daily Illuminator: Once, Twice, Three Times A PDF! December 14, 2009: Once, Twice, Three Times A PDF! Busy week, last week. We released not one, not two, but three PDFs! 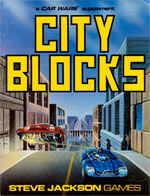 First on the list is Car Wars City Blocks. Along with those counters and these rules, you ought to be able to put together a game of ol' Car Wars with just what's available on e23. But we have faith that you'll dutifully let us know what else you still need to play it. Ah, symbiosis. Next stop for the PDF train is GURPS Traveller: Alien Races 2. I guess it's about aliens or something? Dunno. A title like that is so ambiguous.I really wish we were more specific about things. It would really help sell the book. Oh well. And finally, we have In Nomine: Liber Canticorum. This bad boy has no less than nine authors, so you know it's gotta be good. I mean, more is better, right? Right. It also has just about every damned Song - and every heavenly one (ba-dum, tish!) - you could ever want for your In Nomine campaign. You know, the one you started running after we released Zadkiel a little while back.